Long aluminium poles outlining the shape of a house on the shore of Lake Michigan in Chicago. Titled House, the structure is by the American artist Sarah FitzSimons, who has spent years putting up outline house structures around the world. Designed as a bare outline with no walls or roof, House features the outline of a typical two-storey home from the American Midwest. The structure sits half on land and half in the lake, with part of its base submerged in the water, which makes it very susceptible to the climatic changes which affect the lake over the course of time. 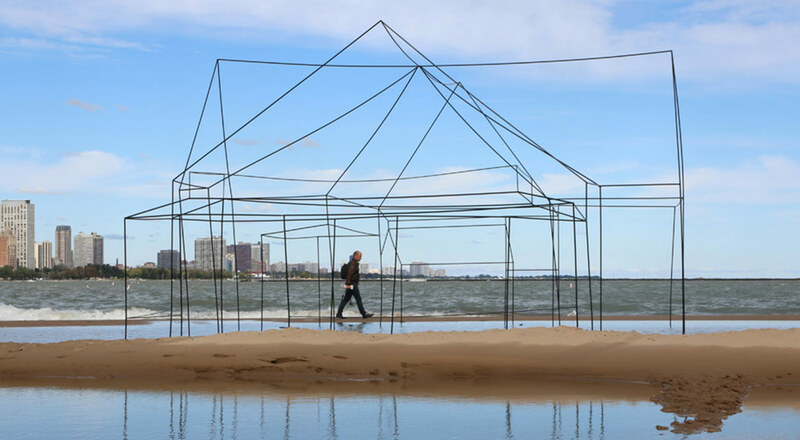 According to FitzSimons: ‘Dream-like, the structure is placed half on land and half in the lake, to reference Chicago’s real and metaphorical connections to water’. ‘Blending the inside and outside of architecture, its minimal lines define the space of a house, yet it physically and psychologically opens and exposes the architecture and how we metaphorically view, think and dream about homes’, she says. House was on show from October 2015 to April 2016, during which time it evolved and also hosted various performances related to the theme of space. Since 2010, the artist has created three temporary sculptures in the form of houses in different parts of the world. The first was on the island of Mandø in Denmark, and was followed by one in Woodside, California.